A new WordPress website for HallmarkFIX provides a streamlined design and improved content management system. 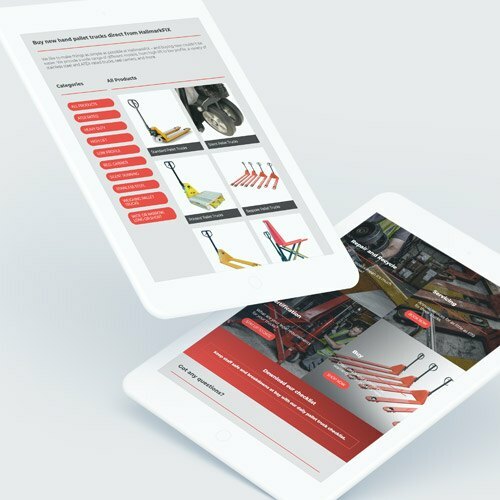 HallmarkFIX are one of the UK’s leading pallet truck repair companies, servicing a range of manual handling equipment. We’ve been working with them on website and digital marketing projects for over five years. Our last website build for HallmarkFIX was an ASP.NET site in 2014. Since then, web standards have changed a great deal, leaving the site feeling a bit dated in terms of design and functionality. 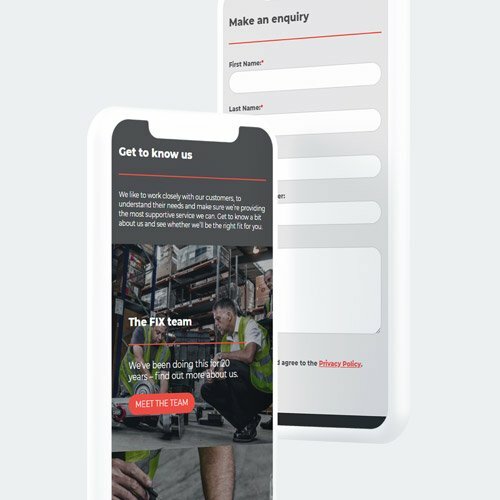 The FIX team were looking for a refreshed design, a more manageable CMS, optimised on-site copy, and improved user journeys leading to more conversions. 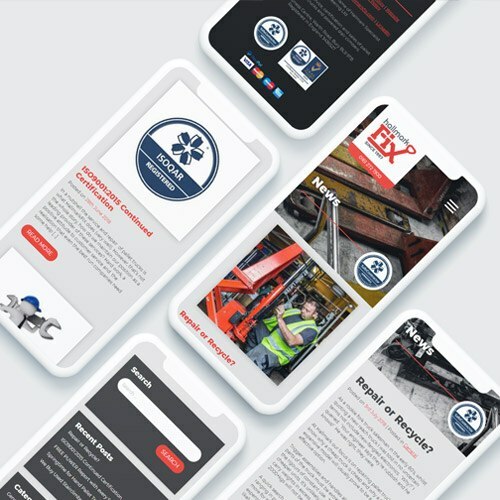 The first goal of the site was for a more engaging homepage design, with a stronger message that introduced new customers to HallmarkFIX’s service in a clear and concise way, and an immediate opportunity to convert. On landing on the homepage, visitors are met with full-screen hero images paired with a very direct overview of HallmarkFIX’s offering, transitioning with a parallax scroll effect. At the end of the sequence, clear contact CTAs are introduced. Below this introduction, users are directed to HallmarkFIX’s core services, dividing the user journey into two clear branches. HallmarkFIX take pride in being helpful and approachable, and web copy needed to reflect this through a written tone that conveyed expert knowledge without being overly formal. 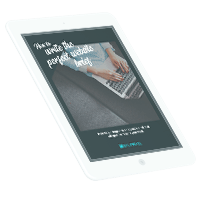 It’s conversational, written to give a similar impact to what customers could expect from picking up the phone and talking to the team directly. This CMS means it is much easier for the FIX team to update their site, allowing them to add new blogs and pages to pursue different content marketing goals. 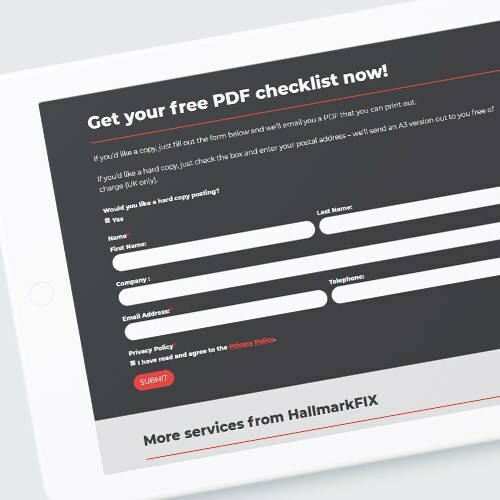 We are also moving forwards with a Google AdWords PPC campaign that aims to improve conversions in key areas around the UK, close to where HallmarkFIX’s nationwide engineers are located. This is the third website that Splitpixel have undertaken for us. The world has moved on… fortunately so have Splitpixel! We needed a comprehensive digital marketing strategy which they have delivered in a professional, reassuring and friendly manner. It’s early days but my perception from the conversations I’ve had since the site went live is that they’re as keen to make this work as we are!